It is generally frowned upon by film critics to describe a movie by declaring it to be a mix of two different movies. "Movie A is like Movie B meets Movie C," and things of that nature. But sometimes the comparisons are so striking that they are hard to ignore. And while Giuseppe Capotondi's riveting debut feature doesn't necessarily demand comparisons to other specific films, it does beg comparisons between the work of two well-known directors, each great in their own way - Alfred Hitchcock and Christopher Nolan. It's as if Capotondi channeled Hitchcock's style of suspense and revelation and combined it with Nolan's flair for labyrinthine psychological drama. To his credit, it's almost unintentional. He's not mimicking their styles so much as he calling to mind their talents. No easy feat, especially for a first time director, but his inexperience makes it all the more impressive. The plot seems straightforward enough at first. A lonely woman named Sonia (Kseniya Rappoport), recently marred by a shocking tragedy, attends a speed dating session, where she meets Guido (Filippo Timi), a handsome, widowed ex-cop who has been attending these sessions regularly for years in hopes of finding the right woman. The two hit it off almost immediately, and embark on a whirlwind romance that seems almost too good to be true for both of them. Their happiness takes a sudden, tragic turn, however, when Guido takes Sonia to the mansion where he works as a high tech security guard, and become the victims of a robbery. When Guido tries to be a hero, he is shot and killed, the bullet grazing Sonia's head. Miraculously, she survives, but finds it difficult to cope in a world without Guido. Soon, however, she finds herself haunted by Guido wherever she goes, hearing his voice whisper her name, seeing his form standing in the shadows. She even receives mysterious phone calls that seem to be from him. Did the bullet do more damage to her brain than she realized? Or is Guido really still alive? Capotondi sets up his conceit quickly, delivering what initially appears to be a clever little thriller about a grieving woman haunted by her past. But then he pulls the rug out from under us, and the game changes completely. In fact, this happens several times. The film switches gears several times, constantly reinventing itself and letting us know that this was not the film we thought we were watching at all. And Capotondi manages to keep the plot's integrity intact through each shift. Often, such rug-pulling tactics come off as cheesy or forced, insulting the audience's intelligence and destroying the film. Here, their fidelity remains solid, with its human elements remaining honest at each turn. The twists never feel cheap or tired, they feel bracingly fresh and surprisingly real. 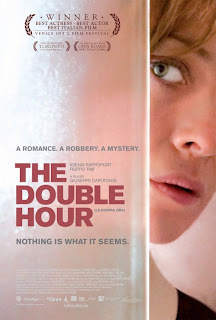 The Double Hour is a taut and twisty thriller whose surprises genuinely surprise and whose shocks genuinely shock. Just when you think you have it figured out, it changes its game again, plunging its audience into a mind-bending rabbit hole where nothing is what it seems. Capotondi has no pretensions or lofty goals, he just delivers a solid, endlessly engaging thriller every bit as unconventional and entertaining as Nolan's Memento. It's only a matter of time before someone tries to lure him to Hollywood, my only hope is that he keeps his integrity. The Double Hour shows he's got the chops to do great things, here's hoping he continues to live up to it. 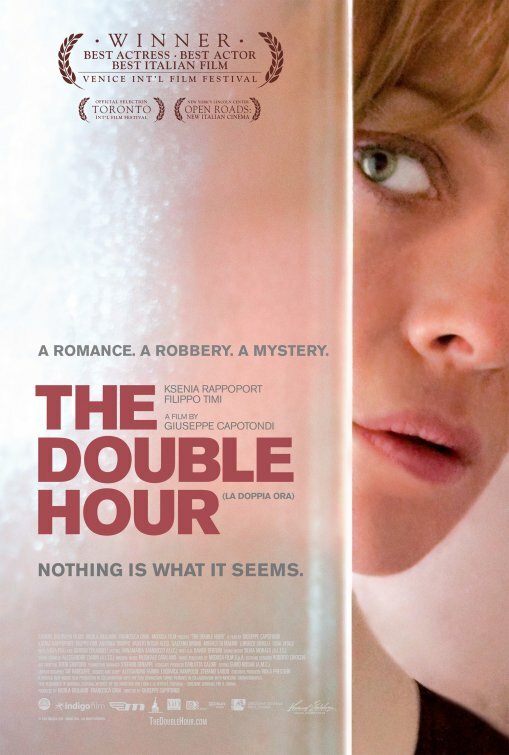 THE DOUBLE HOUR | Directed by Giuseppe Capotondi | Stars Kseniya Rappoport, Filippo Timi and Antonia Truppo | Not rated | In Italian w/English subtitles.